Reminiscent of the Joey Harrington-led Miracle in the Desert of 2000, the Oregon Ducks once again broke hearts in Tempe, Arizona with a 61-55 triple overtime win over the Arizona State Sun Devils Thursday night. In what some fans would call a rebuilding year and others would call a year to fire all the coaches, the Ducks are now tied for second place in the tough Pac-12 North Division headed into November. When things go wrong it’s always tempting to point the finger of blame, and certainly there’s no shortage of that going on. But Thursday night the Ducks did enough to come away with a tough road win for the second game in a row — in part because the coaches did some things right, and when it came down to it, they did at least one more thing right than Todd Graham and company managed to put together across the field. In a game like that one, there are inevitably enough “what-ifs” to last a season, but the Ducks’ coaches had the solid strategy, play-calling and game management to put the team in a position to win. Things the coaches called right is the subject of this week’s Three-and-Out. 1. Take the points. Over the past few years Oregon has made a living of going for two points after its first touchdown and foregoing field goal opportunities in favor of chancy fourth-and-whatevers. 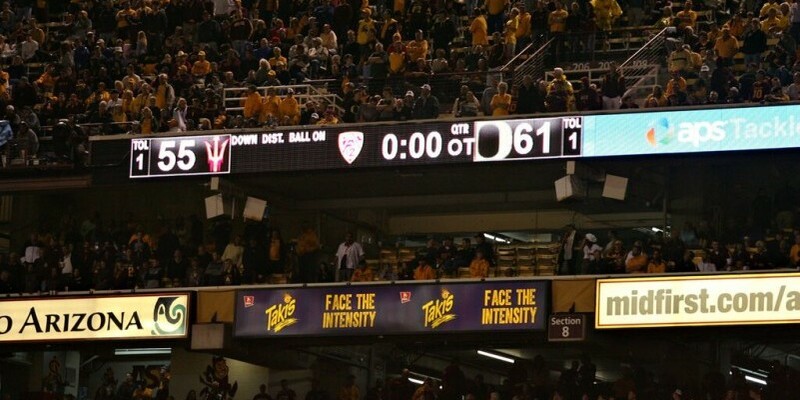 It hasn’t worked all that well this year and the Ducks abandoned the strategy against the Sun Devils. Score one for the coaches. Twice the Ducks took the threes from field goals on fourth-and-goal, and they took the single-point kicks on all but the last touchdown, which required a two-point attempt due to the third overtime rule. It turned out to be a game where every point counted, and aside from one dropped sure-touchdown pass, the Ducks didn’t leave anything on the table. ASU place kicker Zane Gonzalez missed his first three field goal attempts. The Ducks’ kicker Adam Schneider outshined Arizona State kicker Zane Gonzalez, who missed three field goals, and the Ducks’ coaching staff one-upped Sun Devils coach Todd Graham, who in Pete Carroll-fashion called two consecutive pass plays from first-and-goal from the three in the third overtime, with the first pass falling incomplete and the second being a walk-off interception. 2. Know your team — and your opponent. Oregon coach Mark Helfrich and his staff knew coming into the game that ASU was going to blitz, blitz, blitz and blitz some more. The only way to win was going to be with big plays. While generally considered primarily a strategy against the pass, the blitz is also a solid defense against a running game, as there are a lot of very-much-alive defensive bodies in the box. Ducks running back Royce Freeman got his 100+ yards (112 to be precise), but 64 of them were on one play, leaving a paltry 3.4 per carry average on the other 14 carries. Pounding the ball against the Sun Devils wasn’t going to work, and the coaches knew it. Leading Pac-12 rusher Royce Freeman got over half of his yards for the day on one TD run. Many fans were left wondering whatever happened to zone read plays, which were Oregon’s bread and butter with Marcus Mariota running the show. Well, guess what! Vernon Adams Jr. is not Mariota. He hasn’t had the time in the system to run the zone read plays the way Mariota did, and along with most of the rest of the world, probably doesn’t have the right skill set to do it in the first place. But what the Ducks do have is a strong corps of receivers with the ability to make plays, and Adams has the ability to make lemonade out of lemons. The coaches put him in position to do just that. The result included two pinpoint passes to the back of the end zone — one to tie the game in regulation and one to win it in the third overtime. The game plan was designed to take advantage of the skill sets of the players on the field and what the opposition was giving up — not based on what worked with a different set of players in a different year. This may not be brilliant, but it is solid thinking. Score two for the coaches. 3. Clock Management. The Ducks started their final drive in regulation with 5:02 on the clock, needing a touchdown and an extra point to send the game into overtime. Given the way the defense was playing, scoring quickly would have been a recipe for a loss. In very un-Oregon fashion, the Ducks marched 60 yards in 13 plays for the needed score, while consuming all but the final 12 seconds of regulation. Adams’ Hail Mary to Dwayne Stanford in the back of the end zone was far from comforting — and nothing you would give a coach the discredit of drawing up — but it worked, and it left the Sun Devils with no time to retaliate. It did take some luck and a lot of skill on the field, but the one thing that was under the coaches’ control — the use of the clock — was managed as effectively as worldly possible. Score three for the coaches. Undeniably, the defense remains a team weakness. But on a night when Arizona State ran up 742 yards of total offense, the Oregon defense still made the plays that it needed to make to secure the win when needed the most. Holding the Devils to a field goal after three lock-down plays from the Oregon 14-yard line to start the fourth quarter was huge. So was Tyree Robinson’s interception of a Mike Bercovici pass to set up Oregon’s final score in regulation. 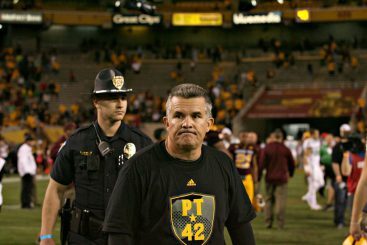 ASU coach Todd Graham didn’t seem to appreciate the humor of the situation. There are those who think that the Duck defense is a joke. In the 2000 Miracle in the Desert, the Ducks and Devils were tied at 49 in regulation. But in spite of ASU’s offensive outpouring, the 2015 Ducks held them to 41 in regulation. And it was the Duck defense that got the last big play in a game of big plays when Arrion Springs intercepted Bercovici’s pass in the end zone. Oregon’s defense a joke? He who laughs last laughs best. It was that kind of game. Arrion SpringsMark HelfrichMike BercoviciMike MerrellOregon Ducks FootballRoyce FreemanThree and OutTodd GrahamTyree RobinsonVernon Adams Jr.